Is This Serious? Why is My Pinky Finger Numb? pt Health July 6, 2016 Is this serious? Many people assume that symptoms of numbness or tingling in the pinky are caused by carpal tunnel syndrome. However, if you’re experiencing numbness in your pinky finger and half of your ring finger, it could be cubital tunnel syndrome. Today we’ll address these symptoms, as well as a possible cause and treatment options. If you’re seeking medical care for your symptoms, find a physiotherapy clinic near you and book an assessment for numbness in the pinky finger today. Ever hit your funny bone? That uncomfortable tingling, numbness, and pain in the little finger, ring finger, and elbow are the symptoms we’re addressing – important, because that numbness in the inside of the hand can develop into pain over time. Have you noticed symptoms of pinky finger numbness and feel concerned? Book an assessment with a physiotherapist near you today. Although there could be any number of causes for numb pinky fingers, a common cause is cubital tunnel syndrome. 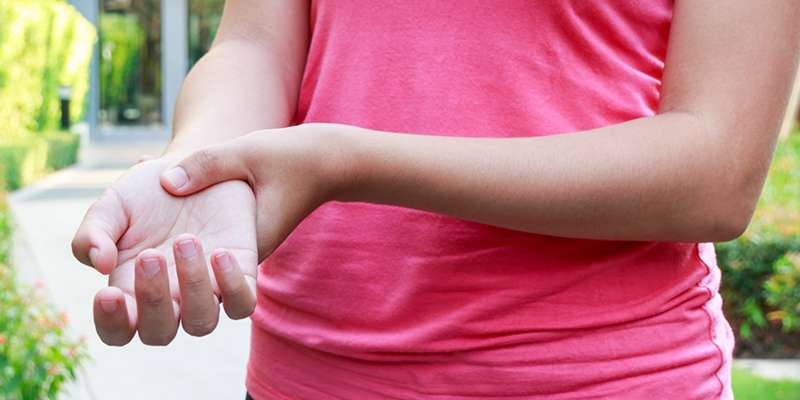 Cubital tunnel syndrome is caused when the ulnar nerve becomes trapped. This nerve travels from the side of the neck passes through the inside of the elbow to the hand. It can become trapped on the inside of the elbow, which is what causes that tingling sensation. If you’re concerned that any of these habits have led to numb pinky symptoms, book an assessment with a physiotherapist near you today. If caught and treated early and effectively, you can see an improvement in symptoms within a relatively short period of time.